Most people will know this as “that wicked busy intersection in Japan” rather than its given name. 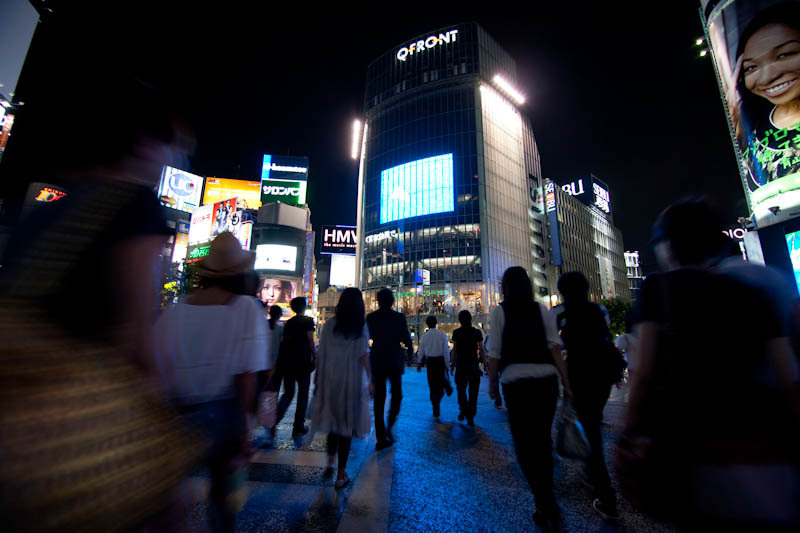 Of course, the description is mostly true as Shibuya is one of the biggest hubs for the various subway and train stations in Tokyo in addition to being a massive shopping, cultural and gourmet centers in one of the world’s most densely populated cities. Since my apartment was a mere 5 minutes from Shibuya, I had to cross Hachiko almost every day and honestly, it never gets old. If you’ve ever been around the Arc de Triomphe in Paris and the ridiculous round-about, this is sort of the same thing. There’s a build-up to it as the lights turn and then you get the sense of “Okay…here we go!” as you flood into the intersection with hundreds of other people. If you’re meeting friends in the area, strangely enough the busiest area in town is a popular meeting spot and just about everyone will know exactly what you’re talking about if you mention Hachiko. There’s lots nearby including popular department stores like Tokyu, 109, Bic Camera and the three Parco buildings in addition to all the various small shops that are commonplace everywhere in Tokyo. Just tell anyone to meet at the statue. The actual story of Hachiko is a rather sad one. In 1925, a professor at the University of Tokyo named Hidesaburō Ueno would walk to Shibuya station with his dog, Hachiko. The pooch would go home and then come back to the station to greet his master when the professor would return at the end of each day. This routine would continue until one day, the professor suffered a fatal stroke on campus and never returned home. However, Hachiko would continue to come to Shibuya station everyday, hoping to see his master coming home. The dog would loyally maintain this routine until his own death 10 years later. The dog’s loyalty touched the local commuters, who would bring him treats and food everyday when he would come to the station, precisely when the train was due to arrive. A statue, the extremely popular meeting spot, now stands where Hachiko would wait and you can also see the actual Hachiko at the National Science Museum of Japan. It’s like a swarm of bees! What is strange is that it looks less crowded when I visited there… but it depends on the time. If you go out on working hours, people are working, so it’s naturally less crowded. is this true, oh god what a crowd? but Japanese obeyed their traffic rules properly, thanks for your video. Nice article. have a nice day. Seen this much crowd first time in Japan. Many people may have been died there. Nice Post.I like the way you write about all this stuff.